On Sunday, we will remember Brother Roger. It will be the anniversary of his death. And we will also recall his 100th birthday and the 75th anniversary of his arrival at Taizé. He left us as a legacy one of his major concerns: peace, sharing, solidarity among human beings. He spoke of “struggle and contemplation”; he knew that God’s goodness can overflow in our lives in kindness, in compassion for those who are afflicted. Across the earth new forms of distress—displacement of populations, environmental disasters, mass unemployment, violence—all this calls for new solidarities. So each of us can ask themselves: am I willing to give my energies to allow these new solidarities to grow? Am I ready, without waiting, to begin with those around me? This week, the forums and workshops are valuable for this personal questioning. I would like to express our gratitude to all those who came to help us deepen this searching. You encourage us by your commitment, by your skills. I hope that through the meetings these days, we are encouraging you, too! Signs of hope support us. More and more local initiatives of sharing are emerging, for example with migrants. Migration, which is increasing everywhere, will give a new face to our societies. Brother Roger always welcomed refugees, already when he was alone at Taizé during the Second World War. We are happy to continue this and to have recently settled on the hill a family from Iraq. Another sign of hope is seeing the growing awareness that we all belong to the same human family. It is true that there is fear of others, of strangers, and we all experience this. Yet we do not find a solution to this fear by isolating ourselves behind walls, but only by seeking to encounter those we do not know. Do not Christians have the vocation to promote universal brother- and sisterhood? Did not Christ stretch out his arms on the cross to welcome every human being? We are grateful that leaders from various Churches are joining us this week. Don Manuel, the Cardinal Patriarch of Lisbon, came for the week by bus with a group of young Portuguese. Cardinal Monsengwo arrived from further away, from Kinshasa, Congo. We warmly greet both of them. Representatives of other Churches will arrive for Sunday. Their presence is a valuable sign that we are on the road with the whole Church, with all those who love Christ. And we are touched that among us there are people of different religions. A Jewish rabbi and his wife and a number of Muslims are already here. Some Buddhist and Hindu believers will also come. The commitment for peace unites us. There are many people in every country who are seeking peace for the human family. They see globalization as a chance to realize a universal fraternity. So one question will become more and more imperative; I already mentioned it last Thursday: Is it not essential to set up supranational bodies, and even a kind of universal authority, which would lay down rules to ensure greater justice and to maintain peace? The summer weeks here enable us to live universal friendship on a small scale. You young people bring your beautiful imagination. You manage to create a sharing between different faces of humanity. At Wanagi Tacanku, at the edge of our village, your creativity becomes beauty and communion between peoples. Another part of Brother Roger’s heritage is to express by our community life the unity of the human family. For us brothers, it is a joy to come from different countries and different continents. And these days, for the first time in our history, we are all together. We do not have enough rooms and so some brothers have to sleep in tents. Starting next week, a number of brothers will leave for the places where they live on different continents. In this connection I want tell you some news and ask your prayers for the perspective it opens. We have decided to start a fraternity in a very beloved country, Cuba. In September two brothers will go to living in that country just to share the life of people, and also to be a place of prayer and welcome. We have been speaking a lot about solidarity this week. The short text you received at your arrival, “Taizé 2015,” explains how we will move forward in the next three years. Three words that for Brother Roger expressed the spirit of the Beatitudes will guide us: joy, simplicity, and mercy. For the coming year it will be that simple word “mercy”—God’s compassion, compassion between human beings. To remain faithful in a commitment it is important to go to the wellsprings of solidarity. The icon that we see in the front of the Church can help us. It is the icon of mercy. By looking at it we welcome Christ’s mercy and we send it towards those who are wounded. Sometimes we ourselves are the ones who are wounded. Each of us is invited to help and to give, but also to accept to be helped and to receive. We are not alone in following Christ. The pilgrimage of trust continues. The meetings in Taizé and elsewhere will support us, especially the European meeting in Valencia in Spain in late December, and the African meeting in Cotonou, Benin in September 2016. We are very happy to be welcomed in Africa. One last word. I would like to express our deep communion with the young people gathered at Tlemcen in Algeria. 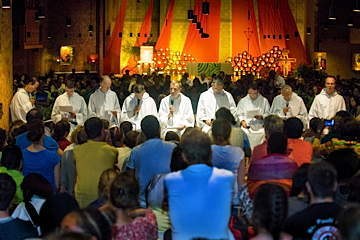 For ten years now, every summer, young people have been organizing two weeks of meetings with the same themes as at Taizé. They are mostly students from across Africa. Their meeting is a clear sign of hope for the future of the African continent.